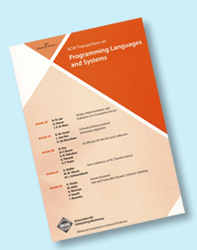 ACM Transactions on Programming Languages and Systems (TOPLAS) is the premier journal for reporting recent research advances in the areas of programming languages, and systems to assist the task of programming. Papers can be either theoretical or experimental in style, but in either case, they must contain innovative and novel content that advances the state of the art of programming languages and systems. We also invite strictly experimental papers that compare existing approaches, tutorial, and survey papers. Original papers submitted before September 1, 2014 can be considered for presentation at PLDI 2015; authors should put a note in their coverletter to indicate interest. Every effort will be made to make a decision by the PLDI 2015 notification date, provided authors return revisions within the requested number of weeks. Papers that are revised versions of earlier conference paper(s) won't be considered for presentation at PLDI 2015. TOPLAS is available on-line in the digital libraries and in print through membership the Association for Computing Machinery (ACM). 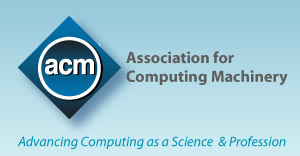 New options for ACM authors to manage rights and permissions for their work: ACM introduces a new publishing license agreement, an updated copyright transfer agreement, and a new author-pays option which allows for perpetual open access through the ACM Digital Library. For more information, visit the ACM Author Rights webpage at authors.acm.org. ORCID is a community-based effort to create a global registry of unique researcher identifiers for the purpose of ensuring proper attribution of works to their creators. When you submit a manuscript for review, you will be presented with the opportunity to register for your ORCID.